Business owners, supervisors, and managers have a legal responsibility to provide a safe working environment for their employees. 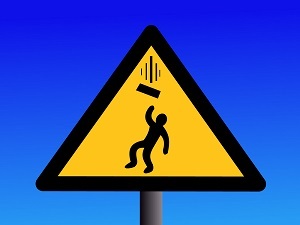 If you’ve sustained injuries due to falling objects, you may be entitled to workers’ compensation benefits. Unsecured beams swing and hit a worker who is moving across the jobsite. Unsecured hand tools fall and hit a worker standing below a scaffolding. Incorrectly stored tools or building materials fall and injure a worker. Crane, hoist, or boom loads are too heavy. Machinery is defective or malfunctions. Warning signs are posted or hazard areas aren’t barricaded. Workers aren’t trained to take the correct safety precautions. Due to the physical nature of their work, warehouse workers, foresters, and miners also sustain higher than average numbers of workplace-related falling object injuries. Hardhats provide some protection from falling object injuries, but objects falling from high distances can often create forces resulting in death or permanent disability. For example, a three-pound hand tool falling from a high of 200 feet hits the ground with 1,062 pounds per square inch of force. An eight-pound object dropped from 200 feet hits the ground below with a force of 2,833 pounds per square inch. Georgia law requires businesses with three or more employees to provide workers’ compensation insurance. Coverage must be provided to both full and part-time employees, regardless of their length of employment. When you’re injured at work, you should report the incident to your employer immediately in order to protect your right to benefits. If you’re too injured to make the report yourself, a supervisor should initiate the paperwork on your behalf. Medical benefits. When you’re injured while performing job-related duties, your employer is responsible for any necessary medical care. Treatment is provided by a doctor on the employer’s panel of physicians. Mileage and travel expenses can also be reimbursed as part of your medical treatment benefits. Temporary Partial Disability. If your injuries have you working in a reduced capacity, Temporary Partial Disability (TPD) benefits help cover the difference in wages. Temporary Total Disability. When you’re unable to work at all, Temporary Total Disability (TTD) benefits provide income replacement at two-thirds of your weekly wage. Permanent Partial Disability. Permanent Partial Disability (PPD) benefits are paid once a worker is no longer receiving TTD or TPD benefits. They are intended to compensate an injured worker for the permanent physical impairment on a body part or the body as a whole due to an on-the-job injury. Death benefits. If a worker is killed on the jobsite, death benefits provide funds for funeral and burial expenses, as well as financial support for the worker’s spouse and children. Navigating the complexities of the workers’ compensation system can be an enormous task when you’re injured and worried about lost income. Having an experienced attorney to advocate for your needs can make the process of securing a settlement less overwhelming. Rechtman & Spevak is committed to helping Georgia residents receive the maximum possible workers’ compensation benefits. Our legal team has helped assist employees of Home Depot, United Parcel Service, FedEx, Delta Airlines, Emory University/Emory Healthcare, Kroger, Publix, Northside Hospital, Piedmont Healthcare, Walmart, Lowes, Waffle House, Chick-fil-A, Randstad, and other local businesses in receiving the compensation they need to move forward after a work-related injury. Please call today to schedule a free, no-obligation consultation.